final disc rinsing by pressurized water jets from the feed pump. Refined manufacturing techniques are used for all our models, which are practical in use and comply with PED standards. 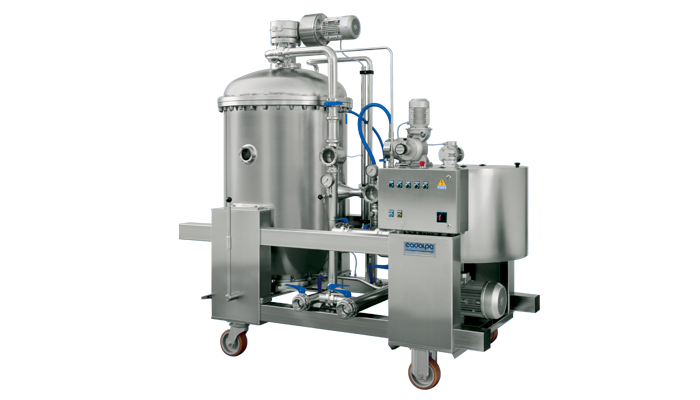 These filters are used for wine or beer must, clarified wine of all types, syrups, nectar-type fruit juice, wine vinegar, and concentrated must or grape juice. They feature perfectly stable integral pre-coat, even in the case of prolonged interruption. They also allow reconstitution of the pre-coat when it becomes clogged due to bad handling or inadequate metering, with integral recovery by means of recycling with the filter closed. Residual liquid in the filter housing is totally filtered and the discs undergo final rinsing by pressurized jets of water from the feed pump. Exhausted pre-coat is detached by centrifugation and ejected without the need for vibrations or scraping.